The Velasco 43F, a unique blend of luxury power boat and traditional trawler. 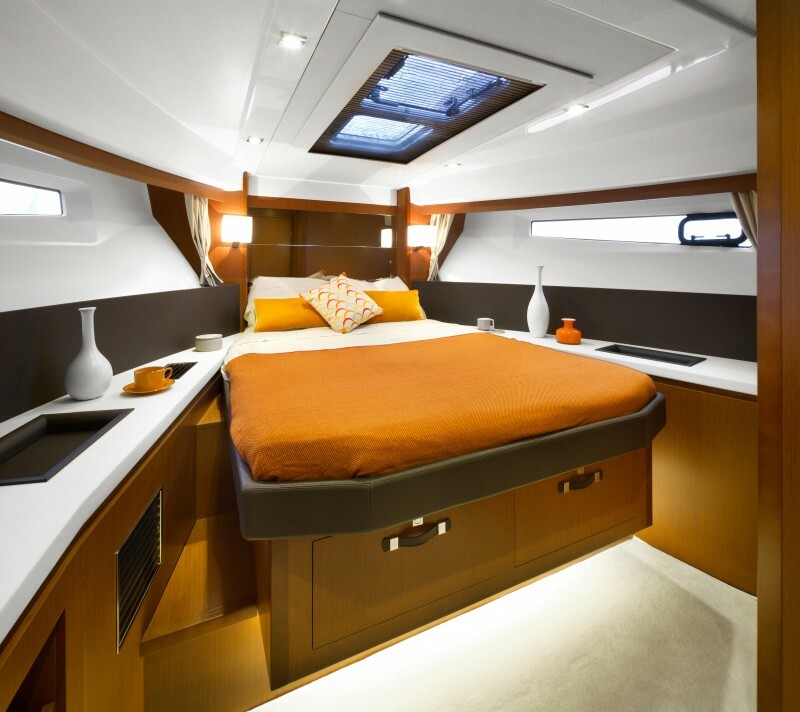 Designed for smooth, safe cruising at high speeds, the Jeanneau Velasco 43F fly bridge cruiser is a unique blend of luxury power boat and traditional trawler. Despite what you might think, It’s not easy coming up with a winning design. For the most part, to be a winner, the final product needs to hit the bullseye in three unique ways. First; the boat needs to be aesthetically good-looking; second, it has to be practical and easy to use; and finally, it has to be affordable so people will actually buy it. The new Velasco 43F (F for flybridge), accomplishes this mission, beautifully blending these three essential ingredients perfectly into one great family cruiser. Powered by twin 380 horse power Cummins diesels engines with traditional shaft driven V-Drive transmissions, The Velasco 43F will comfortably perform at 25 knots. And while speed is important, it is by no means the defining features of this exciting flybridge cruiser. 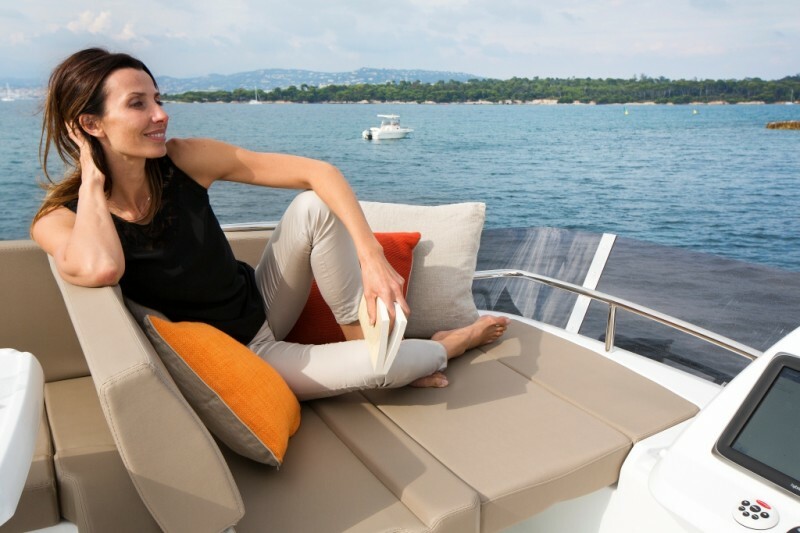 There are plenty of places to lounge in style aboard the Velasco 43F like this great spot on the flybridge adjacent to the helm station. 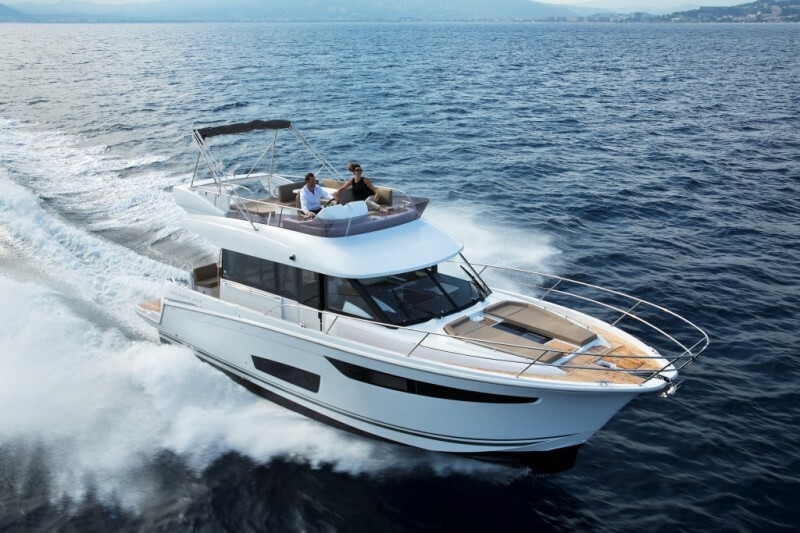 Ideally suited for spending time on deck, the Velesco 43F is sure to please whether on the bow lying in the sun, dining in the cockpit or enjoying each other’s company on the fly bridge with family and friends. A great view of the main salon looking aft through the large sliding doors to the aft deck area. Note the large windows and great open space. Step inside and enjoy the contemporary styling of a modern yet timeless design. Lots of open space, big windows for plenty of light, inside steering station complete with sliding doors for easy access to the side decks, and great galley are just a few noteworthy features that make the interior of the 43F truly exceptional. 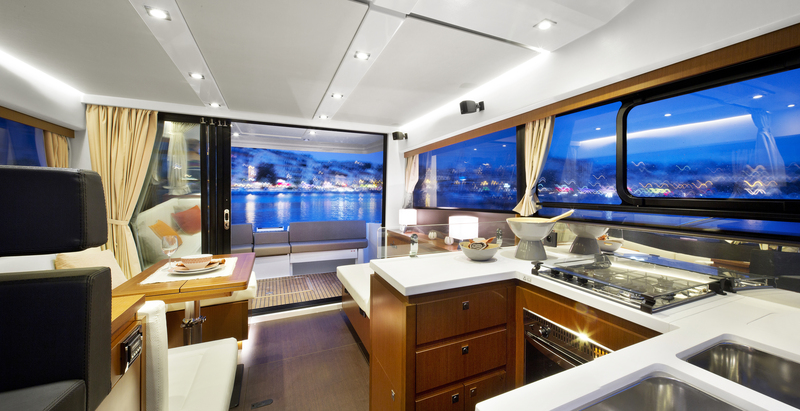 Below you will find a large owner’s cabin forward complete with private head and shower. A second guest cabin is located aft along with a second head and shower that is easily accessed by your guests. Great owner’s cabin forward for the master of the ship. You won’t see this on your average trawler! The Velasco 43F along with the smaller 37F can be summed up as a modern-day trawler but with plenty of kick to get you from A to B quickly, safely and in plenty of style. More than anything, the Velasco 43F is a winner! We hope you agree and we will see you at this year’s Fort Lauderdale International Boat Show.